We will create a party tray which controls the start and end of a party through various light and sound effects. The tray, outfitted with light sensors, will react when plates are placed on top of it. When the tray is lifted, a disco ball starts spinning and LEDs on the table light up and move through a sequence of color combinations. 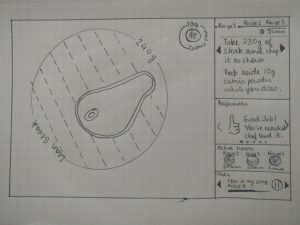 Based on the number and location of plates, we will play a musical beat and/or melody. No music plays until the tray is lifted off the table or until the users take a plate off of the tray. 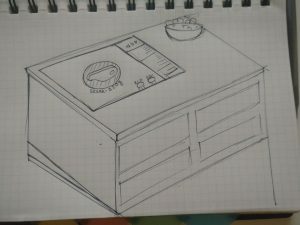 Then, when the plates are replaced back on the tray, the music sounds are eliminated, one by one, plate by plate. Once the tray is placed back on the table, the LEDs turn off and the disco stops spinning, indicating the end of the event. For this lab, our task was to build “Cuckoo Clock” mechanics. We first drew out specifications for the doors that would open and close using one mechanism. We also wanted the bird’s movement to come from that same force. Initially, our plan was to build sliding doors that would open after pulling a string that was attached to the doors using hooks we created. However, the sliding doors needed stability which we thought could be provided by placing the stationary and moving doors on the same track. But, we found that there was too much friction between the tracks and the bottom and tops of the doors and we couldn’t open the doors in a seamless fashion. What’s more, we found that the hooks we created weren’t stable enough to open the doors. 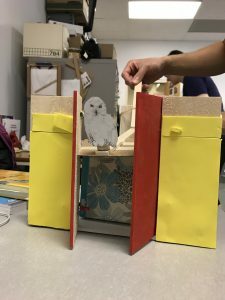 We chose to reevaluate our plan and instead, built a mechanism that would simultaneously push the bird out and open the doors outward. 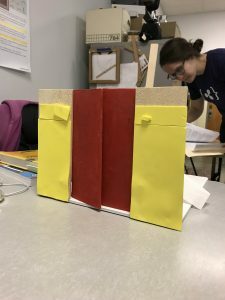 We built stationary boards (supported by “L” shaped pieces of cardboard) to which we connected the doors that would actually open. Using rubber bands and push pins, we adjusted the elasticity of the bands so that the doors would open with ease and would close on their own. The bird was attached to a flat, triangulated piece of cardboard and both of these pieces were connected to a small, wood beam. Using a small hinge, we attached this beam to another piece of wood and created a lever to push the bird through the doors. The lever was attached to a stack of wood pieces and is held together with a rubber band. Finally, in order to get the height we needed, we placed this entire mechanism on top of a tissue box. Using the HTC Vive was my first, true experience with VR. In the past, I’ve used makeshift sets like Google Cardboard but now realized that that was a simple introduction into the true power of VR. I was truly impressed by this technology’s ability to completely transform my world into an underwater shipwreck next to a Blue whale or into an artist’s canvas where I could paint and draw in the air around me. Perhaps what was more fascinating was how realistic and true to a real-world experience using the VR headset actually was. I played fetch with a robot dog and looked over the edge of a cliff all from the basement of South Hall. To enhance this experience, I think could be helpful to be able to adjust how close or far text and the art canvas appear. For example, one of the screens with text was too close and too large and hurt my eyes to read it. If I had the ability to control the distance between myself and some text, it would have been a more pleasant experience. The part of my experience I liked least was the weight of the headset. After some time, the weight became too much and I had to remove it. To address it, a design team could revisit the materials used to build the technology, remove the unnecessary components, and they could also design slimmer and more comfortable hardware. This lab presented unique challenges that I hadn’t met in earlier assignments. 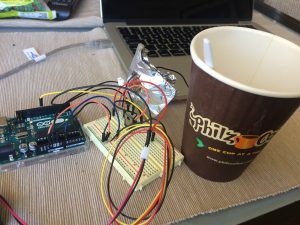 Because of the servo motor’s limited range of movement, I had to find a way to distribute weight in such a way that would encourage the motor to move forward. I researched how bugs and other animals move and the only animals that move in side-to-side fashions (like the servo motor) are sea creatures. That wouldn’t work for this project. I ultimately came up with a creature of the future whose feet are made of tack glides for furniture, a paper towel roll, a chip clip, and a plastic beam and hairclip to help distribute the weight. The creature of the future moves by turning the potentiometer left and right. Pipe cleaners to create a Quidditch hoop to tie this back to Harry Potter. For this assignment, I wanted to find a unique instance of a thoughtless act. I was searching around for an interesting use of everyday objects and it wasn’t until I was at my friend’s house that I found what I was looking for. 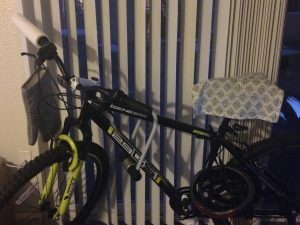 They keep their bikes stored inside and while it’s in the house, the bike is also used as a paper towel holder, a bike helmet holder, a U-lock holder, a drying rack for damp dish towels and an oven mitt rack. They also keep their bike close to the kitchen so all of the objects it stores are readily available. For this lab, I chose to make a coffee cup that stirs itself. 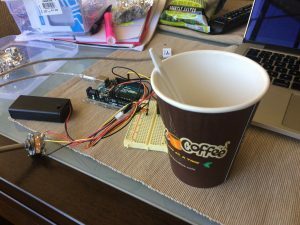 I used the DC motor to power the spinning/mixing of the spoon within the coffee cup and I programmed the potentiometer to control how quickly the spoon stirs the coffee. For this lab, I chose to incorporate Harry Potter into my project once again. 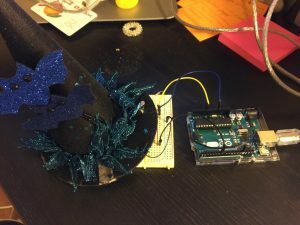 This time, I chose to trigger the Harry Potter theme song when you wave your magic wand over the Sorting Hat. When you do, the main song from the movie will play from the hat. Our main goal is to help those who want to learn how to cook and prepare beautiful meals, improve their skills. 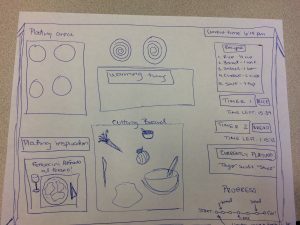 We want to help choreograph meals so that all components associated with cooking culminate simultaneously. For example, we will have several timers so you can track and time individual items separately. There’s also a digital display of the recipe on the board and a progress indicator which rewards the cook as they achieve milestones. Finally, another important component of presenting a meal is its plating. We also intend to provide suggestions to the cook so that they can prepare for and present their guests with a well-choreographed meal. Noise cancelling headphones have changed my life for the better and at this juncture, there’s no turning back. However, when I was first introduced to them, I thought they were outrageously priced, not worth the investment, and that they, quite frankly, looked very strange. I even tried on a pair to try to better understand what their benefit was and why anyone would want to invest in them. Even after that, I wasn’t convinced. It wasn’t until I borrowed a pair to use on a cross-country, red-eye flight that I realized their utility. By being able to eliminate a majority of the noise around me on the plane (the engine, nearby conversations, loud children, the loudspeaker), I was able to sleep more deeply and I was also less distracted by the commotion around me. As a result, my red-eye flight was no longer a completely draining experience. I was actually able to enjoy my flight and once I landed, I felt more awake and I was more productive. The efficacy of these headphones changed the way that I view products that I may not initially understand. For example, if someone had presented me with a cargo cult mock-up of noise cancelling headphones, I would not have understood their utility nor would I have ever thought about buying them. By showing me a representation of the headphones, I would not have been able to understand what kind of noise they eliminate and to what extent. What’s more, because I had no prior knowledge of the power of noise cancelling headphones, I would have doubted their ability to function in the way they promised. In my case, I had to actually experience them in order to fully understand their functionality. Headphones are ubiquitous in modern day culture. Whether they’re Apple’s signature in-ear white buds, Beats by Dre’s over-ear noise cancelling headphones, or on-ear types, we see them everywhere we go. The fact that I’m able to describe a large variety of headphones indicates that philosopher Jean Baudrillard was right. This product, like many others, has a “sign value” (Blauvelt, 16) and was largely impacted by growth and changes to the design field. These products are no longer used just for listening to music or to mute airplane engines; They also indicate status, brand loyalty, or not wanting to be disturbed. As our world continues to grow and change, I believe that proper design will play a critical role in improving how we communicate with others and interact with our world. As Andrew Blauvelt said, “Without this ability to integrate objects into our environment, the world would seem a daunting place – an ever-changing visual cacophony” (Blauvelt, 15). For this lab, I chose to take a modern approach to Morse Code and where the input signals come from. 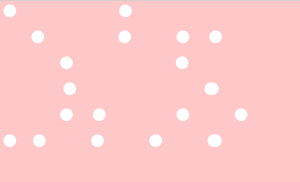 For my project, the dots come from keyboard inputs and the dashes come from FSR presses and together, you get a visual of the dots and spaces for the dashes. The blue LED also flashes in accordance with the FSR presses.